Hey Beer, let's just move you to the back, OK? Let's get Cheese up front. Sure, beer is what made Wisconsin (or at least its biggest city) famous. 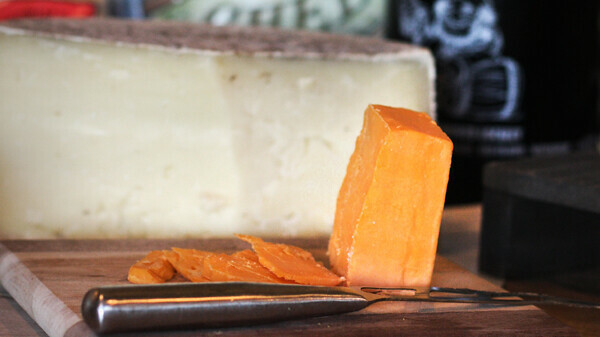 But in nearly every objective category, our cheese industry overshadows brewing. BEER: The U.S. Census Bureau estimates there are 2,813 drinking places in the state, while the Tavern League of Wisconsin has more than 5,000 members. CHEESE: The state has 10,860 licensed dairy herds, according to the Wisconsin Agricultural Statistics Service. BEER: The state offers two versions of a Milwaukee Brewers license plate (one current, one retro), allowing drivers to show their Brew Crew pride. CHEESE: The phrase “America’s Dairyland” is emblazoned on every standard Wisconsin plate, and the 1980s-era plates were as yellow as a block of cheddar. BEER: While a tall, cold one makes many people think fondly of Wisconsin, beer has never been made an official symbol of the state. The polka, however, is the official state dance, and the old oom-pah-pah just isn’t the same unless you roll out the barrel. CHEESE: Bills naming cheese the official state snack and Lactococcus lactis (the bacterium that makes cheese) as the official state microbe both failed in the state Legislature in recent years. However, milk is the state beverage, and the cow is the state domestic animal. Note: Beer statistics are for 2012 and cheese statistics are for 2013 unless otherwise noted. Sources: Brewers Association (brewersassociation.org), Beer Institute (beerinstitute.org), Wisconsin Department of Revenue, Wisconsin Milk Marketing Board (EatWisconsinCheese.com), U.S. Census Bureau County Business Patterns, Wisconsin Tavern League.